Big meets have finally arrived. The 46th Burlington Invitational takes place this Saturday at 9am, and will provide athletes a stage to show what they’re truly capable of. Being the first Invitational of the year, the Burlington Invite gives teams a chance to play their cards and put together a championship winning team. With its unique scoring system of a combined total boys and girls points, the larger, more balanced teams have a major advantage over their competitors, but don’t let that take away from each individual competition. Looking at the seedings, Saint Johnsbury is the favorite to win by a fair margin over Essex and Mount Mansfield. Seeds are just that though, when the rubber hits the road, all bets are off. With such a close division 1 indoor state meet this year (for those that don’t recall, MMU, Essex, and STJ came within 1.5 points of one another for the boys championship), this meet should be a breeding ground for exciting finishes in both events and overall team title. At big meets like these, it’s easy to get overwhelmed as a spectator and miss some incredible events that transpire. So to make life easier, we broke down what we expect to be some of the most fascinating races and athletes to watch, and some records that could go down on Saturday. Burlington’s sophomore boasts a first seed in the 110h, a 5th seed in long jump, and an 8th seed in the 300h. Don’t expect any hurdling state or meet records to fall just yet though, Alec Eschholz’ records look virtually untouchable for now. Last week he barely missed the division 1 state record in high jump, clearing 6’7″ with ease. Look no further than Muttilainen for a potential state record breaker this weekend. 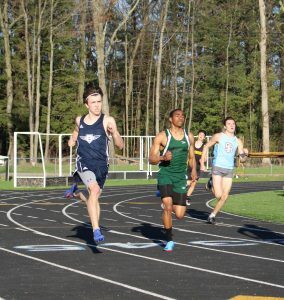 MMU’s sprinter has had plenty of second places, following Burlington’s Ismail Liban for the past three years. Now as a senior, Ogilvie is coming off of a strong indoor season primed to stamp his authority on both the 400m, and the 4x400m. Oxbow’s star runner has the top seed in the 800m by 11 seconds. She could give the other girls a 60 meter head start and still probably win, while breaking a state record in the meantime. She’ll face a tough challenge in the 400m, squaring off with Rice’s Sonia John. What makes this such a unique battle is that John comes from a sprints background, while Giesling comes from a mid-distance background. Having two unique race styles will make the girls 400m an incredible race to watch. Just when you thought that was impressive enough, she’s also one of the top seeds in triple jump as well. She’s got a first seed in long jump with an impressive mark of 17’10″, which comes only 3 inches off of Kayla Gilding’s meet record from 2015. Lewis also holds onto the 6th seed in the 100m. Looking to better his own divisional state record in the long jump (which is also tied with the meet record set by Tyrone Conley in 2007), Pelletier comes into this meet having already jumped 22 feet this season. Â There is no better way to claim your rights as the best jumper in the state than to establish a 22 foot jump in April. MMU freshman William Hauf leads the pack by almost a full second, and could likely be a contender even at the varsity level of this year’s edition. His 11.56 would place him at the 9th seed, an impressive feat for someone who has only competed in a handful of high school track meets in his career. It’s a race to break two minutes. The three contenders looking to do so are Ford, Fenoff, and Looke. Each have either come close, or have already done it in year’s past. Look for an aggressive race that will come down to the final meters. In the boys pole vault, Michael Baker from Essex looks to break a meet record set by Ed Simon from BFA in 2011. Ironically, Baker holds the state record, but not the meet record. With four teams within a half second of one another, this race will be decided by the exchange zones. Remember, 4×100 is about who can move the baton the fastest, not who has the fastest runners. U32’s seed time is less than a half second off of the existing meet record. So if each runner can shave .08 of a second off of their 800(or rather, improve their overall time by .06%), they’ll come across the line with a meet record, and maybe a state record as well. It’s going to be a beautiful day of track and field on Saturday, so sit back and relax. Just don’t blink, because you might miss something incredible.